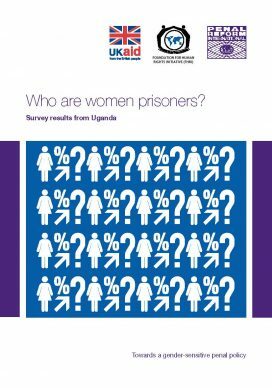 This joint research report with the Foundation for Human Rights Initiative (FHRI) is based on a survey of 194 women in prison in Uganda (10 per cent of the total female prison population) carried out by FHRI between August 2014 and February 2015. By providing facts and figures, the report seeks to illustrate the need for gender-specific policies that respond to the needs of women in prison, and to enable an identification of the key areas to be addressed as a matter of priority. 76 per cent of women surveyed identified themselves as poor or very poor; 32 per cent had never been to school. Over half the women surveyed (57 per cent) were convicted of murder, manslaughter or assault. This is very high compared to the other six countries where this survey was conducted. 35 children were living with their mothers in prison. 37 per cent of women said they had experienced domestic violence. As a result of their imprisonment, 43 per cent of women had lost their job, 35 per cent their home and 31 per cent had had their children taken away. The report includes recommendations with reference to the UN Bangkok Rules. This is the seventh report of our research project inspired by Rule 67 of the UN Bangkok Rules. The other reports focused on women prisoners in the South Caucasus (Georgia and Armenia), Central Asia (Kazakhstan and Kyrgyzstan) and the Middle East (Jordan and Tunisia). This project has been made possible by the financial support of the UK Government. A comprehensive report on the background, profile and needs of women prisoners. Based on a survey in early 2014 of 28% of the female prison population in Jordan and 32% in Tunisia.